The Reebok ZR8 is offered to the market as a mid range home fitness equipment range. 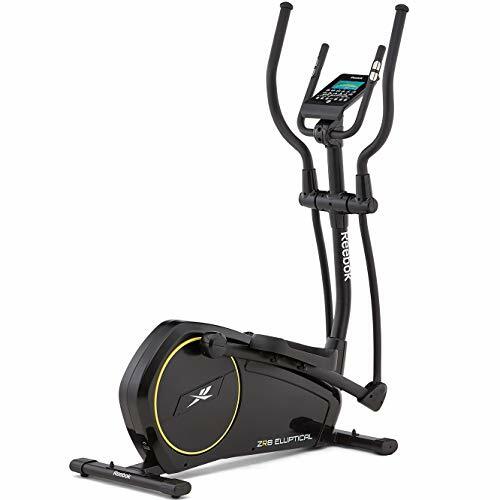 The ZR8 cross trainer is trainer that offers some good features and is well built to last many years of hard training. The ZR8 range cover all areas of gym equipment for the home including running machines, exercise bikes and cross trainers. The aim of this range is to bring the gym into your home at a price that is affordable. Covering the basics well the cross trainer in this range is worth a look. Below we are going to have a look at the features the ZR8 elliptical trainer offers. It covers a wide range of types of training and has some great features that will keep your training varied and fun no matter what level of fitness you are at. Have a run through and see which ones you think will suit you. The Reebok brand is something that many of us rely on for quality. If you are looking to buy a cross trainer from a long established fitness brand then this could be a good purchase for you. The pioneers of so many different fitness accessories and equipment over the years Reebok have certainly got the experience to produce great cross trainers. This model has a large range of resistance levels that will help you step up your strength and fitness easily. The 32 levels are controlled via the LCD display that is easy to control while training. The resistance levels are controlled by the fitness programs or can be set by yourself. The 9kg fly wheel delivers a smooth action that will make training comfortable although at this price levels a larger fly wheel would be nice! The LCD display make training easy to monitor as you work really hard. Vital statistics are displayed in real time including time, distance, number of calories burned and heart rate. This is an important feature that will enable you to work closely to the program you have set and monitor your effort levels giving you a kick when you need it and pulling you back when you are working too hard. The nineteen preset workout programs will make it easy to jump onto the ZR8 and start training, with different types of program to target different types of fitness and over varying length of time. You can work on the long low output work outs to build endurance or click a button to go into the calorie destroying interval training sessions. This is a good feature that makes it a convenient cross trainer but there are models out there that have more functions like the Nordic Track E9.5. Check your heart rate on the go without wearing a chest strap with the hand grip pulse sensor. If you don’t have a chest strap or don’t like wearing them this is a good feature that enables you to easily monitor your heart rate as you are training. If you use the cross trainer for quick work outs where you want o jump on and be finished in 20 minutes this is handy as putting on chest strap heart rate monitor can be a pain and is not ideal for the fast work outs. The dimensions for the ZR8 are below, it is designed to be a cross trainer that fits in the home nicely without taking up too much space. Have a look at the dimensions and see if it will fit in the space you have. The warranty offered is a standard two year manufacturers warranty. This is pretty good and should cover any problems you get for a long period of time. Some of the other more specialist manufacturers will offer better warranties but this is plenty for most people. When you are buying a mid range cross trainer it is a large investment and a good warranty is an important factor. If you are one for buying the big brands then this is on okay cross trainer that offers the functionality that we all need. Let’s face it how many of us really use all of the features that are available on fitness equipment, what is really important is that the basics are covered well and the build quality is good. The ZR8 does cover the basics and has good build quality. But, and its a big but, we think there are far better cross trainers on the market that we have highlighted above that surpass this model in a number of areas. The cost of the ZR8 is around the price where adjustable stride length and incline adjust are available which are very good features to have.